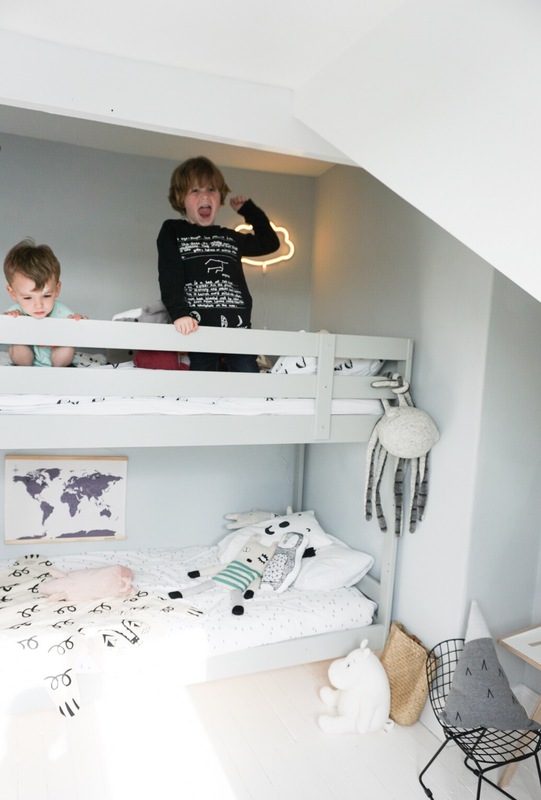 Our house sale fell through, so we decided to move the boys shared bedroom to the back of our house, to a light bright third floor room. It’s westerly facing and gets so much sunshine, meaning they get a bigger, lighter bedroom for all their treasures. Barney (3) and Felix (6) are happy sharing a room, and both enjoy the companionship. Now that we have a little girl, Willa (7 months) we wanted to give her a space of her own and I’ve now created a space for her in the boys old room. Our house is still on the market, but I felt it was important that they all had lovely rooms so they feel secure and happy at home. 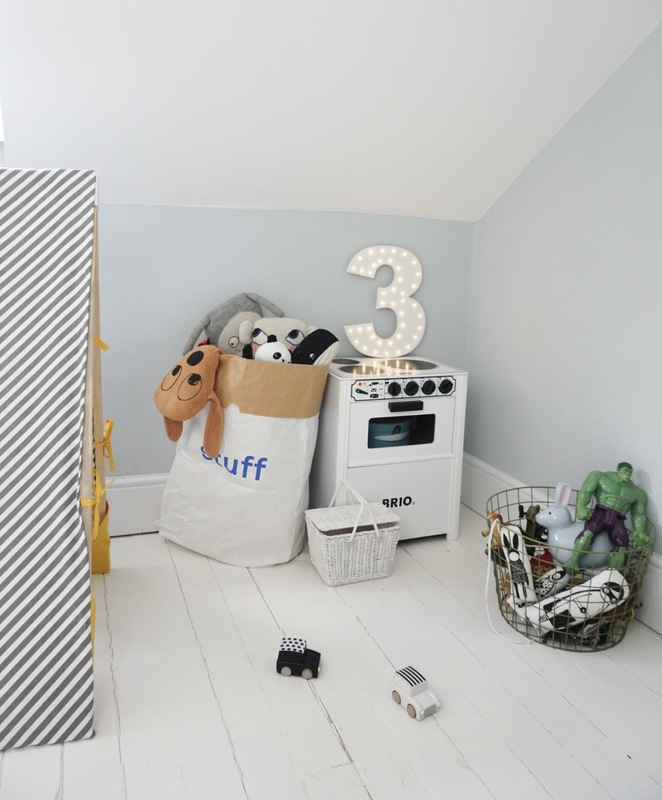 I was keen to use many of the beautiful interior accessories we had already amassed so brought our beautiful world rug back out (from scandiborn.co.uk) which is a brilliant neutral backdrop for pops of colour. I’ve recently discovered a real gem of an online shop, called The Little Baby Company. 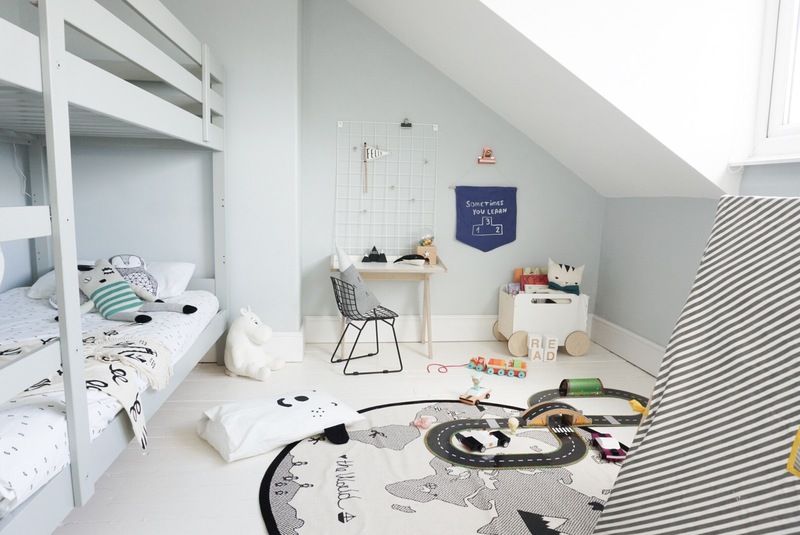 On it I found the perfect cushion for the boys- a grey mountain by Fabelab, which is organic cotton and so soft. I’ve also been coveting one of the double sided happy/sad pillow cases for the boys bunk bed which I also found there. 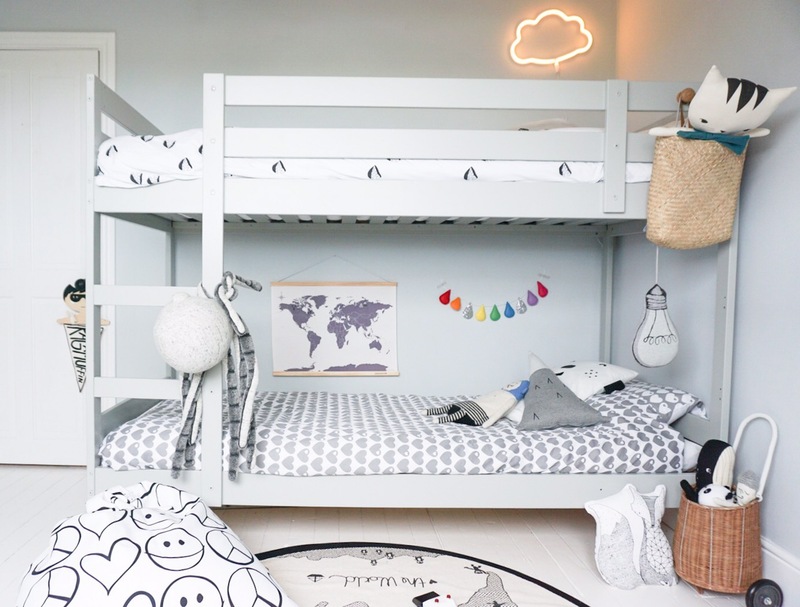 Their bed is just a simple wooden bed from Ikea, which we have painted in Farrow and Ball Lamp Room Grey. It was black previously, but I wanted to achieve a lighter, softer look. Felix was desperate for somewhere to have his books to read in bed, so I screwed a knob into his bed frame and attached an Olli Ella book basket on, which has a leather loop so is ideal, so no more sleeping with heavy books in his bed! 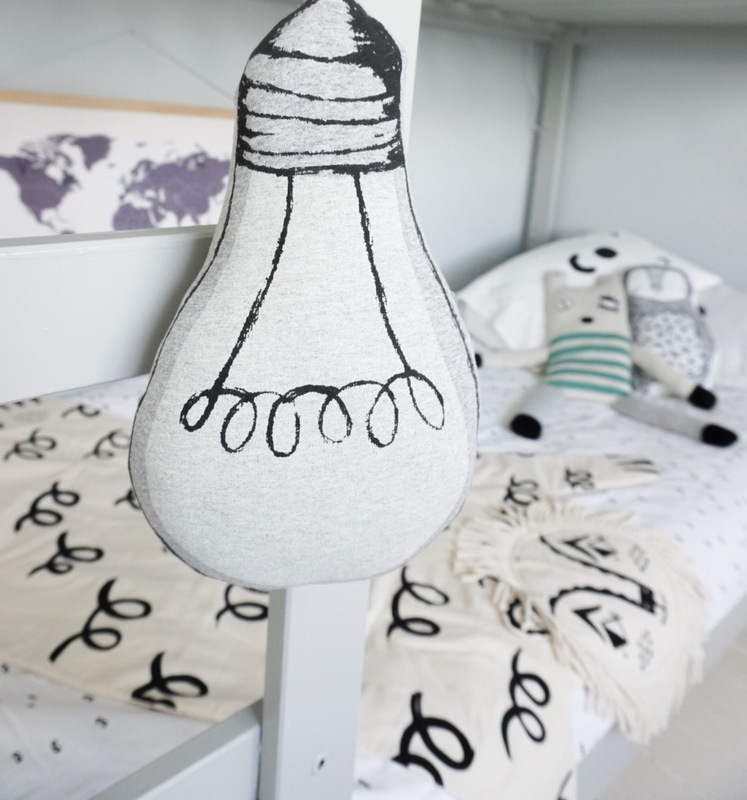 The cloud light by A Lovely Little Company makes the perfect reading companion and has a switch so that he can read for a little bit longer after Barney has fallen asleep. To the bottom bunk, I sourced a grey ‘cross stitch’ world map which comes complete with wooden hanger. I found this online from Urban Outfitters which always has a few home gems to be discovered (the bedding is fantastic from there too). 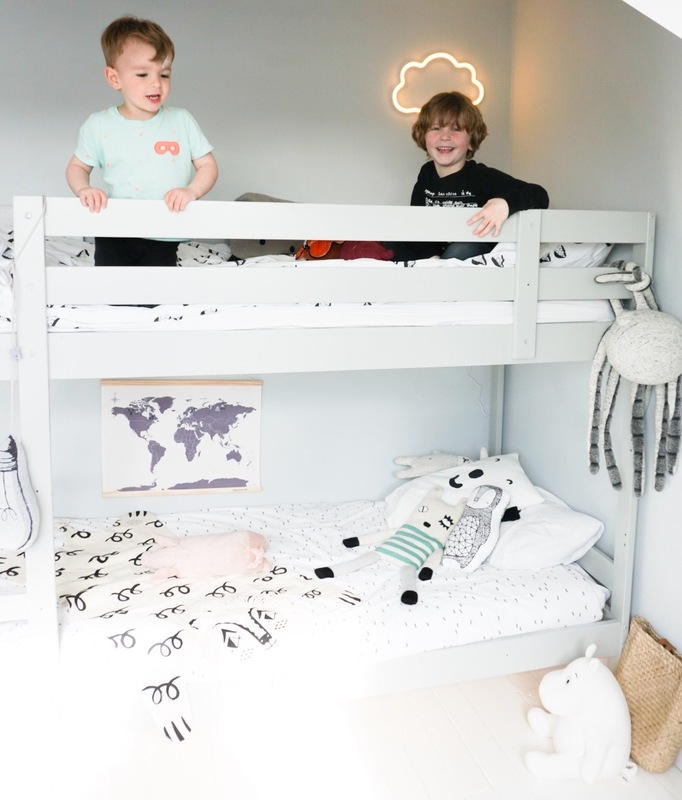 Cosy cushions in monochrome from Ella and the Roo and softies from Lucky Boy Sunday complete the look along with a new grey bedding set by By Graziela. On the back wall, we have a beautiful kids desk from Plyconic. 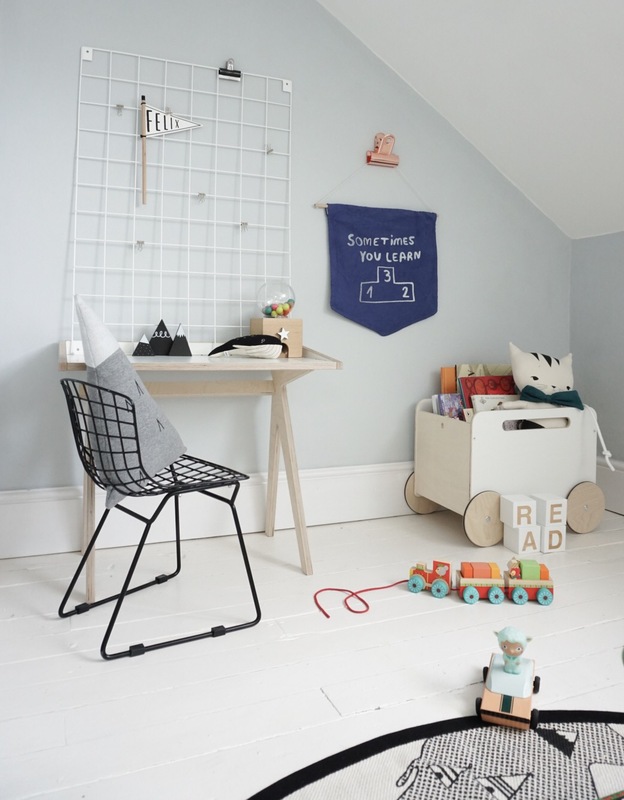 These kids desks can be fitted together in minutes and are incredibly tactile and sturdy. So that the boys can display keepsakes and their artwork, I have placed a Block Design white metal grid above it which I found at This Modern Life. It’s incredibly versatile and lots of fun. It can be a struggle to find innovative and fun storage for the home, looking in conventional places. We have approximately 500000 children’s books (it’s an addiction) so finding homes for them is tricky. Our Ooh Noo storage box on wheels (find them at scandiborn.co.uk) has made a brilliant home for quite a few of the boy’s book collection, and if we were staying in our house I’d find space on a wall to do the Ikea Ribba book shelves again, but I’m loathe to drill more holes in the walls in case we sell in the next few weeks. 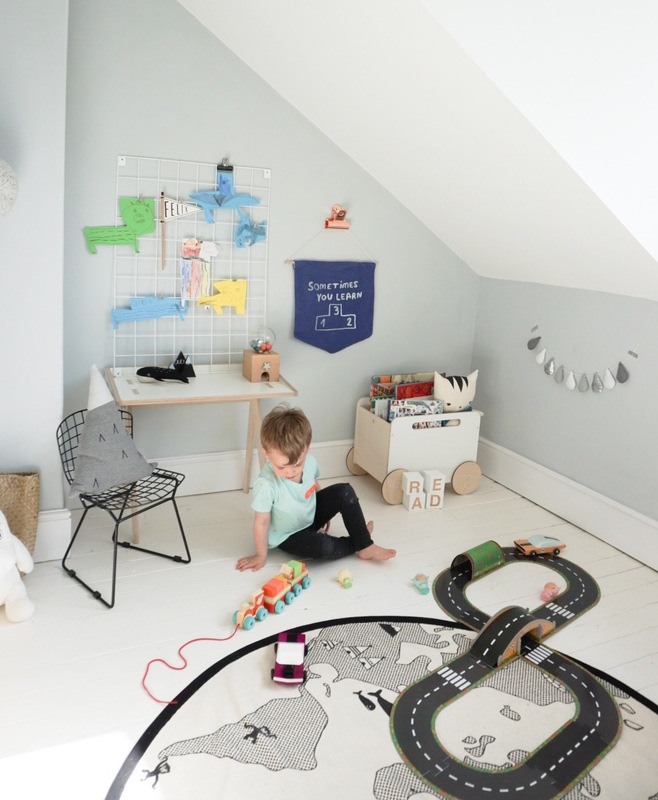 The boys room is the perfect backdrop for some of our awesome Djeco toys. 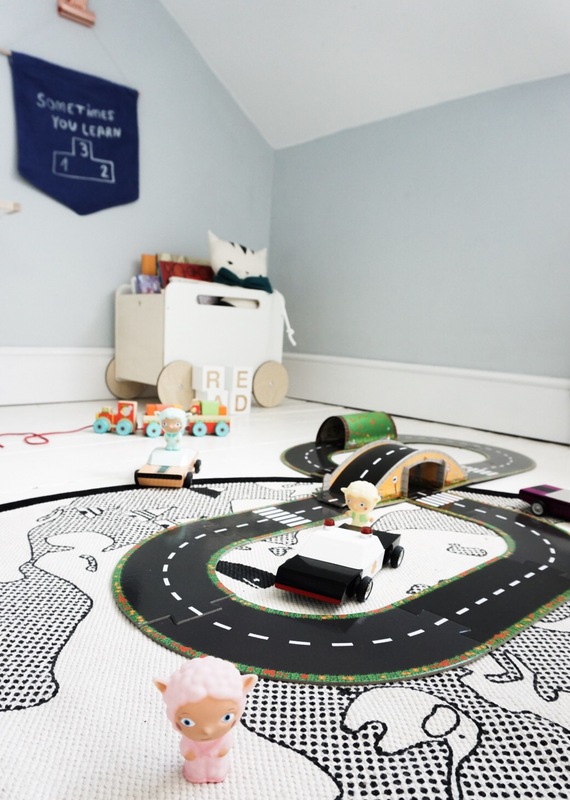 Our car track took minutes to make, can be stored away in seconds and is a massive success with the boys. 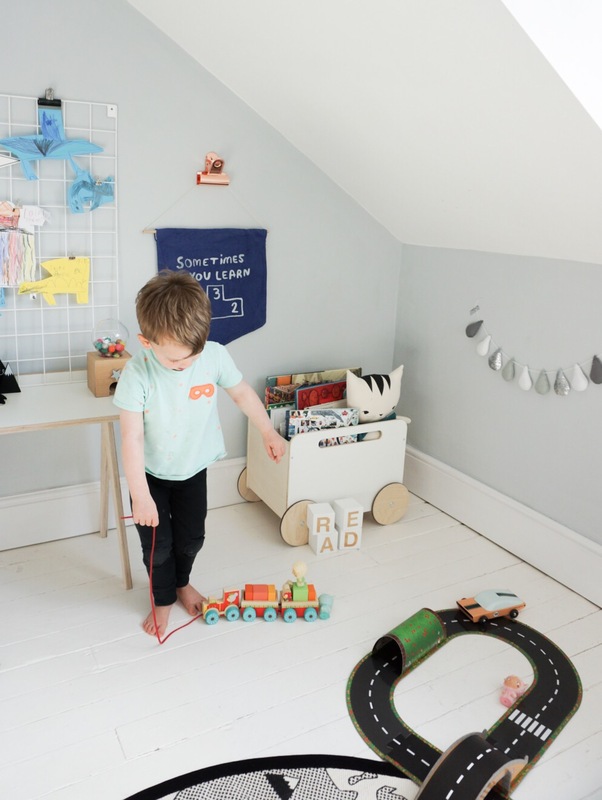 Barney is a huge fan of his pull along train, which is a lovely gift idea, and we found it at The Little Baby Company, who has a large selection of Djeco. They are actually interesting to kids unlinke many stylish wood toys, and are robust enough to be played with on repeat!